Send Bulk SMS Software for Windows based mobile is mobile marketing tool that helps you to communicate with multiple mobile users simultaneously. Now you can easily connect to your customers with bulk SMS messaging program. 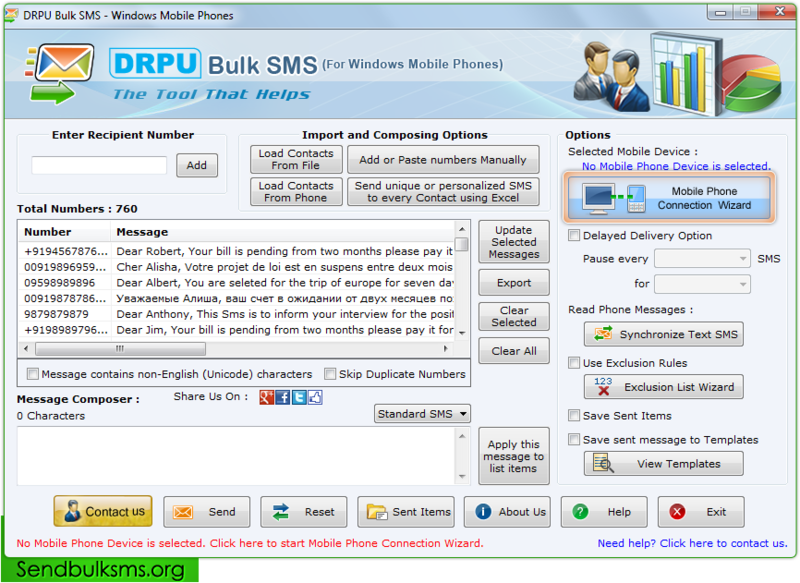 Bulk mobile messaging software sends bulk numbers of text messages from PC through Windows based mobile phones. Mass SMS sender program has inbuilt delay delivery option helps to control and customize the load of bulk SMS broadcasting. Bulk text messaging software provides list wizard option to maintain the list of contacts or groups which need to exclude during the message sending procedure. Bulk text message software supports entire Unicode languages for sending messages in any text format. Step1 : Establishing connection between mobile and PC click on “Mobile Phone Connection Wizard” option. Send thousands of text messages from computer using Windows based mobile phones. Deliver your promotions and offers to the hand of customers. Increase sales, brand awareness and revenue of the company. Send personalized messages, job alert, news alert, product promotion campaign, share market details, event notification, interview calls and birthday greetings. Grow your business across the world and drive new customers. Reach your customers at any place in less time. Provides facility to skip duplicate numbers entries. Drives traffic to your business and increases profitability.